Guys like Steve Nash, Allen Iverson, Shaquille O’Neil, Dwayne Wade and Chris Paul dazzled fans during March Madness and then parlayed their performance into mega bucks. Sports bettors that can spot the future superstars – whether their teams make the Final Four or not – can make some wise bets this month. SportingbetUSA.com is watching several hot young players in key match-ups this weekend during the NCAA First and Second Round and through to the NCAA Finals. Joakim Noah will be talked about more then once this spring if he leads the Billy Donavan Florida Gators to a Final Four appearance. With his athletic body and mind for the game, Noah could be enticed with millions of dollars to leave Florida early, as he is just a freshman. The Gators are listed at 25-1 at SportingbetUSA.com and if Noah continues to shine, this could be a great investment. J. J. Redick and Sheldon Williams will get showered with attention during The Dance, but Duke’s 6-foot-10 freshman Josh McRoberts could play a starring role. Duke has taken on all comers in 2005-2006 and is currently 9-2 at SportingbetUSA.com. Tomorrow is the last day to enter SportingbetUSA's March Mayhem Brackets Contest for a chance to win an LCD TV. 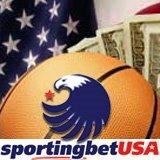 March Madness and NBA odds are continually updated at SportingbetUSA.com – Where America Bets.